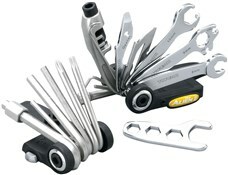 The Topeak Alien 2 multi tool is an award-winning gadget that is head and shoulders (or wrenches and screwdrivers) above the competition. It's been cunningly designed in a break-apart fashion to make it easy to find and use the right tool. 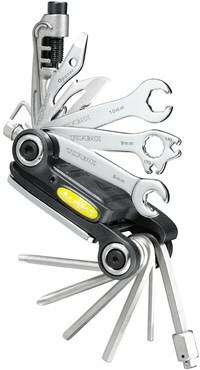 There are no less than 26 high quality tools as part of the Alien, so you won't come unstuck if disaster strikes. There's even a bottle opener for post-ride celebrations. Brilliant build quality and function. The split in half button really helps you with tricky bolts & screws etc... Fits in the smallest of saddlebags and comes with it's own tiny case. The tools are well made, and it the pouch is ideal for keeping it from scratching other items in your bag. A really good value item.